I start college in less than a week (eek! ), but it literally seems like I just graduated from high school yesterday. Senior year was probably the best year of high school for me -- I barely stressed, I did so many fun things with friends, I did well academically, and I was genuinely happy. The thing with senior year is it just doesn't automatically become the best year ever, unlike what HSM 3: Senior Year (yes, I am guilty of loving that movie) makes it seem like. You have to make your year the way you want it, and you have to focus on a little bit of everything. One thing that I really focused on during senior year was not saying no to plans. I had the best friends and I realized that I would definitely miss them in college, so I wanted to make the most of the time I had left with them. I found a way to get around each excuse I was making with them so I could end up going out with them! Too much homework? Do it before you leave and after you get home, no matter how late you have to stay up. Too tired? Go to bed early the next night. Have to work? See if you can switch around your schedule with someone else. Don't say no to a simple opportunity because they'll end up adding up in the long run. Any event that your school has that you're interested in, go! Sports games, dances, fundraisers, etc. are the best things to attend. I attended some hockey games and basketball games because our teams were really good and everyone went, so it made watching the game fun! And I went to every football game because Tyler was on the team. Homecoming and prom are crucial too -- who doesn't love the chance to buy a gorgeous dress?! Attend whatever you would like and bring your friends, too -- you'll be surprised at how much fun you end up having. I didn't really show school spirit until senior year and it made me realize how much I missed out on. My high school was really big into celebrating Halloween; every year it's a huge tradition to come to school on Halloween dressed up in a costume, and the best costumes get noticed! Some of my friends and I decided to dress up as tourists this past year and it was awesome. We went the whole nine yards with old Polaroid cameras, Hawaiian shirts, fanny packs, socks and salads, etc. and we ended up winning as one of the best costumes! Attend in spirit week and go all out. It'll be even more fun if you get your friends to go crazy, too! My senior year was definitely my less stressful year of high school, which is weird because it's supposed to be the most stressful due to the endless amount of college stuff and making sure your grades stay good. I didn't worry about my grades that much, and it made my year so much better. My grades weren't perfect and my grades weren't bad -- they were just good. But I was okay with them not being perfect because I still graduated as eighth in the class -- something that was a huge accomplishment for me! Accept things for how they are and don't sweat the small stuff. Don't procrastinate on anything related to college. Write your college essay as soon as you decide on a prompt, apply to schools during any free time, and fill out any scholarships/financial aid forms as soon as you find out about them. You may seem like you have a while before any of those are due, so you'll put them off. But then you'll get so caught up in senior year that deadlines will come and you'll realize you didn't get anything done -- and then the stress will come. Get everything done as soon as you can and then you'll be able to enjoy your time later! 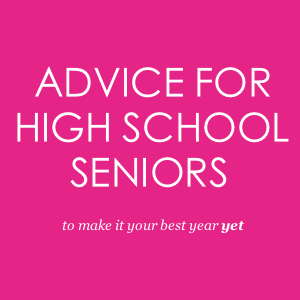 What advice would you have for high school seniors?